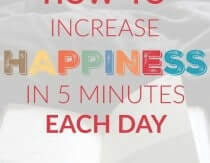 Heather Dessinger 100 Comments This post contains affiliate links. Want to add a cool, minty twist . . .
To your favorite brownies AND save your family money, too? With this two-ingredient mint extract recipe, those goals are done and DONE. 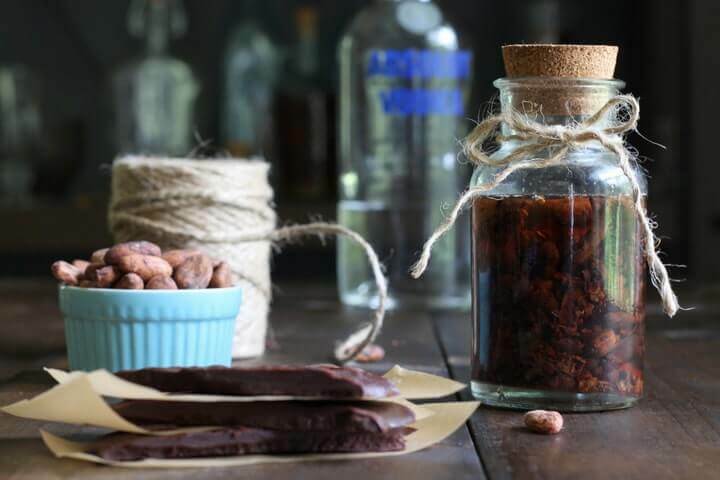 Just five minutes of hands-on time plus a little time for the extract to “ripen,” and you ‘ll be be stirring it into hot chocolate, tea, chocolate mousse, ice cream, peppermint patties, marshmallows and whatever else your heart desires. It also makes an inexpensive, beautiful gift for the foodies in your life. Organic mint leaves (peppermint, chocolate mint, spearmint)- $1.99 per bunch at my local farmers market. The main spirits used to make mint extract – vodka and bourbon – are now often made from GMO-plants and/or enzymes derived from genetically modified organisms. (source) Rum is sometimes used as well, though I was unable to find a definitive answer on whether it is likely to have GMO origins. 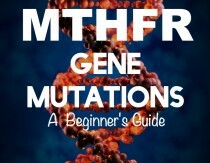 Manufacturers claim that none of the genetic material makes it through the distilling process to the final product, but to my knowledge that has not been independently verified. Organic options are hard to find, but there are certain sources that are still likely to be GMO-free. If you’re using vodka, Absolut says they’re non-GMO, and here are a few bourbon brands to consider. Rum, which is derived from sugarcane, would not contain genetically modified ingredients unless they come from enzymes used in the fermentation process. I was not able to find any information on manufacturing processes either way, but fortunately there are a few organic options if you’d like to go that route. I reached out to one brand, Appleton Estate, and they confirmed that their products are non-GMO. Wash leaves and pat dry. Remove leaves from stem and set aside. Place leaves in a jar and mash them lightly so they will release their oils. Pour alcohol over the leaves. Using a spoon, mash leaves down until completely covered. Cover jar with a tight-fitting lid and store in a dark cabinet for 3-4 week, shaking occasionally. When the extract has reached the depth of flavor that you prefer, strain the the leaves from the extract. Store extract in either a dark container or in a dark cabinet. So what all do you make out of mint extract? Just read that a simple water and peppermint extract will keep all spiders from ever entering our homes! I’m gonna make this for that magical spray with some of my mom’s organic and always spreading market mint. Also it can be used in all sorts of homemade cleaners/fresheners and is medicinally therapeutic in teas and foods. In other words, it’s a workhorse. Sorry but I couldn’t find the link for asking a question. 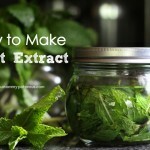 So here it is—-concerning your Mint Extract recipe, how long will the finished product stay good? 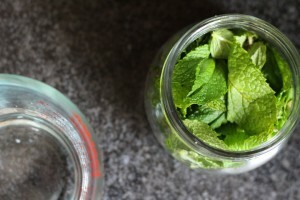 I am always looking for ways to preserve my mint plants as I grow too many..(lol). Thank you for your site. It is full of wonderful things. It should be. All flavored extracts (vanilla, almond, etc.) are made using an alcohol base. This is called a tincture as it uses alcohol. An extract head water, vinegar, or glycerin as a menstrum. this is so great! thanks! funny question: could you use this same method to make other flavors? I am trying so hard to find a way to recreate cucumber melon and can’t find anything and wondered if I used this same method if it might work! i have added cucumber pieces to vodka already and the more you put in the more cucumber flavor! try a small batch and see how it turns out with melon and cucumber? We love to make Strawberry infused Vodka, and I have to say, it’s “consistently” amazing! Taking about two pints of strawberries, cut off the green tops, and then slice the berry in half. If the berry is huge, you can quarter it. Then put the berries in a pitcher and cover with vodka. Use a nice 5 or 6 times distilled Vodka, but it doesn’t have to expensive. We like using Skye vodka, and it makes a great combo. So let it sit for AT LEAST five hours or overnight. The longer it sits, the better the vodka tastes. You will be so surprised at how yummy and summery the vodka is. 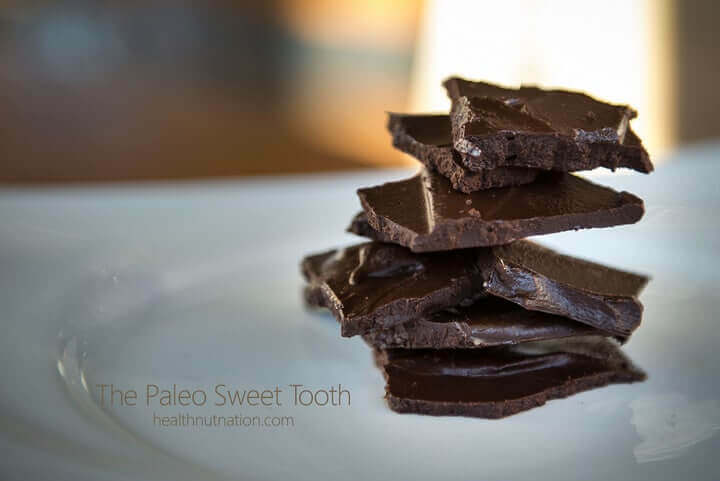 You can just mix it with ice and mineral water, and yummy! Then, to make things even more exciting, you can put a couple of strawberries in the cocktails…when you pop them in your mouth and eat them, wow wow wow, mini yummy vodka shots. We really never have a summer party without Strawberry Vodka! This is such a great idea! Once strained, how long will it stay good? Its alcohol so a while right? It doesn’t really have an expiration date, but it will lose some flavor if left in the cabinet for a loooong time. How much of the leaves are left? I would think they would break down over time! i am wondering if putting all in the blender and giving it a really short turn would help extract more oils – would any one know??? Gudrun, It would help extract the oils more quickly, but your final extract may have tiny bits of leaves floating throughout if it blends too much. A fine mesh strainer might solve that problem, though. I use a coffee filter when I want a very clear liquid. 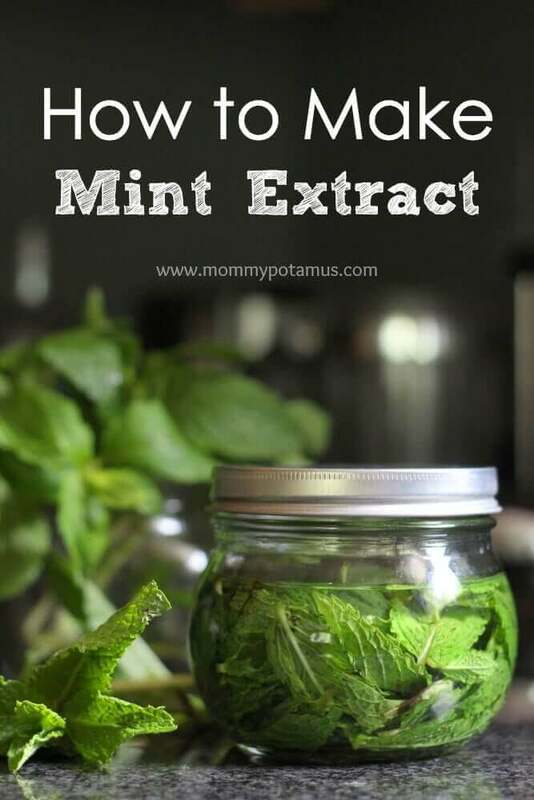 The technique used here to make the mint extract is actually the same as would be used to tincture herbs and other plant materials for medicine-making. In that case, most herbalists do use a blender to chop the herbs prior to pouring the menstruum (spirits) over the plant material. You would strain this after a few weeks first through a fine mesh strainer, then through a coffee filter, or a piece of muslin, something like that. Kept in a dark cabinet, tinctures — and this mint extract — should keep for several years, unless you gobble it down quickly in all it’s deliciousness. A non-alcoholic version can be made with food-grade glycerin. Good luck! This is how you make tinctures/herbal extracts for anything, with fresh leaves you will have the best extraction and shelf life from 100% Alcohol. 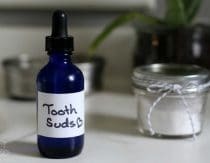 You could then dilute it for your use by adding water, ( if you needed 1 tsp you would add 1/2 of the extract and 1/2 of water. Yes you could still use it if you made it a year ago and forgot to strain it as long as the alcohol content is high enough at least 50% but double check that there is no mold or anything of the sort. And yes blending in the blender will also assist with extraction due to more surface area to extract from 🙂 Have fun !!! Is there a way to make a non-alcoholic version? Vegetable glycerin is used as an alternative when making herbal extracts, I don’t see why you can’t use it instead. However with that said, you should do some research on the process of glycerin as the medium instead of alcohol. 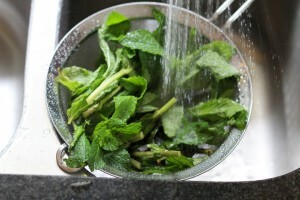 I have to think that if you are using glycerin the mint leaves should be dry not fresh. RAIN vodka is certified organic ! Rain makes organic vodka, which is what I use to make my homemade extracts. Do you think traditional rye whiskey would work (it’s colorless)? We live next to a distillery that makes small batch whiskey using locally-sourced grains (organic), and was thinking local mint + local whiskey = extra goodness! I got the recipe for mint extract of a web site and all i got was put mint leaves in vodka,, didn’t notice anything about a dark cupboard for 1 to 2 months and it said to remove the leave after two days before they went brown,, so I followed these directions and it was all clear , now today i’ve noticed it has gone brown ?? not leaves in there anymore either ? is this still useable or what??? I wanted to make mint fudge for xmas but can’t soak for two month then ! I’m wondering, would you make orange extract in a similar fashion? interesting! once i get organic oranges again i might try lots of shredded orange peel in some vodka! Yes I steep orange peels, cinnamon sticks and vanilla bean in vodka for an awesome kitchen cleaner, but I bet it would taste too good! can i use virgin coconut oil instead of vodka or other alcoholic beverages? I have a bottle of rum that we aren’t drinking, and some mint growing in the back yard. Can this be stored in the fridge? Yes it can, but I would wait until the infusion process is complete. I’m trying this for the first time. It’s been up in the cupboard for about a week and the leaves are turning brown and so is the vodka. Is this what’s supposed to happen? Just made a batch, can’t wait to see how it turns out!! Hi! So excited to make this. I have a big chocolate mint plant that I’ve been trying to find things to do with. Question, if I use Rum, is it okay if it’s Spiced Rum? Captain Morgan, to be specific. Thank you! ??? how about Rose hips I have an over abundance of them this year and was wondering if I would be able to use them to do this. Personally, if you have so many, and you have the patience I’d make rose hip wine. It does take about 5 years to age so patience is a must. But there is no reason you can’t use them in this extract recipe. You’d probably want to bruise them thoroughly first though. I am going to start this process this weekend. My question is, when it is time to use the extract in the recipes, is the amount listed in a recipe the same amount I would use of the homemade extract? a tsp = a tsp in regards to potency? I tried doing this and after about two weeks I took it down and opened it. The mint leaves had soured in the vodka and it smelled terrible. Any ideas what I did wrong? The only thing I did different from the recipe was use vanilla vodka. I’m sorry, I know this is vague but I’m not sure what happened! Hi Mallory, can you explain what you mean by soured? It smells sour and rotten. It did not smell like mint at all. I realized I forgot to mention that the liquid around the leaves was murky and brown. It was like the mint rotted in the liquor. I don’t remember if they were or not but I’ll try again and make sure it covers the leaves plenty. Thank-you all for your help! Mine has been sitting for 2 months and it smells very “leafy”. It doesn’t smell minty. It’s also very green in colour. Is yours green? I’m having the same problem. I let mine sit for 1 month and I tried it and it tasted leafy with a hint of mint. What did I do wrong? I used vodka and I also made vanilla bean extract and I sampled that after just 1 month and it’s great! OK after all this I walked down to the basement again just now and checked my brew 🙂 I started mint leaves in white rum on 7-11-14; it looks more green than brown (but if any one used brown rum it would be brown!) and it smells like alcohol with grass with a mint hint – I did not taste it! then I opened my vodka with black currants, I think I might like that more 🙂 AND THE COLOR IS A DEEP DEEP RED! I would think it would be fine as long as there is no mold on top of your brew. I don’t have much experience with fresh extracts-yet :), but with my dried herbal experiments, the coloring of your batch will vary with the herbs used, but the plants are supposed to break down- thus extracting their goodness. If the taste is good, then you know it’s fine. If it tastes funky or smells sour, toss and try again. 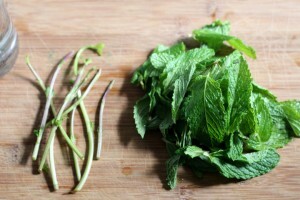 I would imagine as far as the taste would go, the type of mint leaf used will give you a stronger flavor or weaker one. Just strain through a coffee filter for removing the plant material. i used vodka 80 proof for my extract and its been steeping since 10/24/14 and I just checked it and it has a slight brown color to it. haven’t opened it yet but I do know that the leaves were washed and covered. what color should it be and if it has a tint to it and you started out with a clear liquor do you think it is still ok to use? Sounds like you’re right on track. As they brown the leaves will impart some of their colorinto the extract. I just randomly came across your site trying to figure out what is in thousand island dressing, i love all the extract recipes!!! 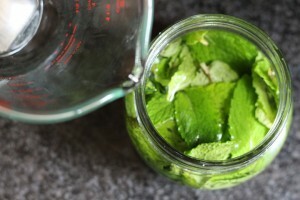 What do you do with the mint leaves after you make your first batch of extract? Can you recycle them in to a newer batch? Or mash them up to serve in mojito? Or just throw them out? hmmm…..
Hi Lynn, welcome! Unfortunately they don’t have much flavor when the extract is finished, so I throw them out. i strained mine by now -have not tasted it either! it is dark (brown/green) but sure smells like minty rum! Hi, i’ve had my mint sitting in a tightly sealed jar for about 2 weeks but it has turned brown and doesn’t really smell like mint but kind of a funky smell. has it gone bad? Would this extract be safe to use in a scented candle? Or would I have to let the alcohol dissipate from the extract before mixing it with the candle wax. Unfortunately, alcohol-based extracts will not work for candle making. I recommend using essential oils instead. I followed a recipe that referenced yours, however it suggested chopping the mint leaves. I processed them only a day after they were picked so still very fresh. However after chopping them I steeped them in vodka. A day later it doesn’t smell minty and fresh like a bruised mint leaf, it smells a bit like wet tea leaves straight out a Ceylon factory. Nice, but not fresh and minty for flavouring my homemade toothpaste. This is the last step in perfecting my toothpaste recipe so I really want to get it spot on. Do you know why it smells like wet tea leaves, rather than mint? Same with mine, it smells like a super strong peppermint herbal tea…. I don’t know if it is the type of peppermint plant or what. Im not sure if this has been asked yet. But when i tried this my batch came out smelling like old swamp water with a slight hint of mint. Not a nice smell. Any idea as to why this happened? Same with me… Not sure if we can use it ? Hi I made mine the same way… But as I see like many other comments it’s dark in colour and smells very medicine-y, kinda terrible. Is it still good to be used on cakes n cookies? I let the leaves soak for about 8 weeks. I also was concerned when I checked my peppermint leaves that I had soaked in vodka for about five weeks. They smelled funky and I just knew that I had ruined the batch! However, after reading everyone else’s posts on here, I realized that perhaps I was on the right track after all. So, I strained the mixture to remove the leaves then ran the liquid through two strainings with a coffee filter. I was able to remove particulates in both strainings and the color is now a lovely shade of brown and smells much nicer. Just wanted to share with everyone in case it helped! I used Everclear (190proof) with my own peppermint and everything was good to go after 4 weeks. I have strained the leaves out then used the coffee filter and it is a nice green-brown color. I made it in a quart but after everything was filtered I only had a pint of extract. Can I dilute it with a weaker vodka to get more extract or should I just leave it as is. One use I have is to spray it under the hood of my car to discourage the rats from eating up my wires etc. (rural area). The last episode cost me over $250 to get things fixed. I followed the recipe, ensuring all leaves were fully submerged in vodka but they started to ferment within a few days. 🙁 Not sure what I did wrong. Also, if you’re trying to avoid GMOs of commercial extract, shouldn’t you use ORGANIC liquor to make yours? Vodka like Ketel One and Absolut are made in Europe with European Union (EU) certified grains. All EU grains are non GMO. I made my own mint and lemon extract and I left it for 4 weeks. I just checked it and it’s brown. Is this normal? I’m worried I did something wrong though I followed the recipe exactly. hi.i want to make mint extract for cookies or other baked goods but I am confused.store bought mint extract is from peppermint,spearmint?i have spearmint plant so idont want to use that and then have a weird smell extract and ruin my cookies or cake because I am gf,dairy free and all these gf flours cost a lot to waste…..what should I use to make the extract?is the same to use spearmint or peppermint?or not? My survival plants teacher makes tinctures out of 90%? Rubbing alchohol. Have you researched this instead? DO NOT USE rubbing alcohol!! It is not edible. While rubbing alcohol will extract components from herbs, it is suitable only for topical use. For instance, as a rub for sore muscles. That is how your survival plants teacher is doing it…to make rubs. Mint extract used for flavoring your food and drink MUST use an edible alcohol. So I did this, let it sit for almost 2 months. I ended up with brown stinky vodka. The smell was like rotting mint and the taste was just harsh vodka with a hint of mint. This seems more like another one of those ‘grow a celery stalk from the one you cut up from the store’ ideas. Great in theory but crap when applied practically. Ended up just being a waste of my time and money. I think I’d have had better ‘mint extract’ if I’d drank the vodka and ate the mint. Yours went stinky because you overstuffed your alcohol. All the herb must be submerged under the vodka. Any herb sticking above the alcohol level would rot in the air and spoil. It’s important to ensure that you stuff down all your mint and shake it to ensure it all stays covered. Try again…yours was a technique failure and not a recipe failure. I love your blog! 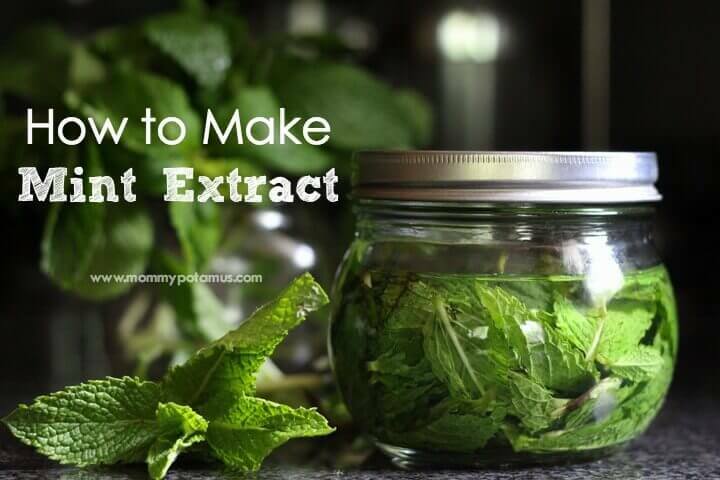 Today I was looking up extracts and found your mint recipe, and like me, you don’t want to use GMOs and other not good for the bod ingredients. I am not even sure I want to use alcohol…it’s expensive to me, since we don’t drink, it’s something I don’t have just around the house, and I’m not sure I’m excited about the ingredients and components of it anyway. I’ve been mulling over what to do about the extracts for the last few days, and I decided I wanted an extract as close to water based as possible…no extra vodka or rum flavors added to raw foods or added expense or GMOs invited to this party! I wasn’t sure if anyone had tried this (I didn’t want to waste good herbs on a botched batch! ), and nearly every recipe I’ve found has called for alcohol or glycerin. While the alcohol serves a purpose to preserve the extract over long time periods, I’m planning on using mine pretty quickly, if it’s cheap enough. Anyway, in my digging I just came across these two recipes, and I thought I’d share it with you. It solves both the GMO and alcohol flavor problem and makes these extracts even more frugal, check it out! I’m going to try these out and let you know how it goes. My herbs are organic pots I bought for $2.49 at Trader Joe’s, and if I never have to buy them again, then I’ll never have to invest more than a few cents in my mint extracts again…? What did I do wrong? (I made a very small batch also – and I used Five O’clock Vodka – very cheap). Mine turned brown after a week or so 🙁 thoughts?